Q: Why my PDF to flip book slides from left to right? I have found that my pdf to flip book slides from left to right. It is not the normal English reading habit. I don’t know what on earth leads to this problem. Is there any solution to solve it? We have provided two modes for you to read. They are RighttoLeft and LefttoRight. 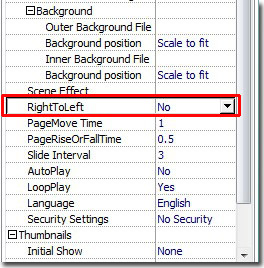 The RighttoLeft means that to set page right to left for reading, for example Arabic read Arabic book from right to left. We embed this function to meet different demands. You can find the “RightoLeft” bar in the panel and transfer “Yes” to “No”. Then your problem will be solved.